A major factor in this discussion is the influence Republicans and Republican-leaning independents who agree with the Tea Party exert in primary elections. Aside from challenges to Republican incumbents in state and congressional races in 2012, the 2012 GOP presidential primary season was marked by the rise and fall of a series of candidates who appealed to the party’s more conservative wing. Overall, 62% of Republicans and Republican-leaning voters who agree with the Tea Party say they “always” vote in primary elections. 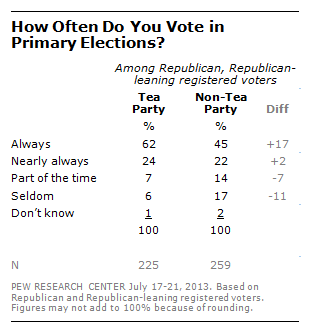 By comparison, only 45% of non-Tea Party Republican voters say they always vote in primaries. Non-Tea Party Republicans make up 60% of Republicans and Republican leaners overall, but because they are less likely to vote in primary elections, they compose a far smaller percentage of GOP voters who say they “always” vote in primary elections (48%).